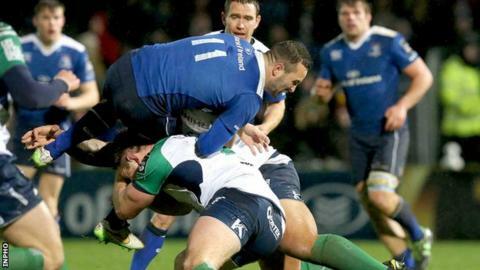 Leinster moved above Connacht into second place in the Pro12 table after winning the Irish inter-provincial derby at a wet and windy RDS in Dublin. Johnny Sexton's 15th-minute penalty was the only first-half score as Connacht produced some stout defending. However, Leinster upped the pace after Sean O'Brien's introduction and Josh van der Flier's try put them in control and Sexton kicked the conversion. Ian Madigan added a penalty as Connacht suffered a third straight Pro12 defeat. In contrast Leinster, despite having lost all four of the their European Champions Cup games, have now earned six straight wins in the Pro12 to move to within a point of leaders Scarlets, who were edged out 29-27 by Cardiff Blues on Friday. Early-season leaders Connacht will drop to fourth place if Ulster defeat Munster at Kingspan Stadium on Saturday. Van der Flier's crucial 61st-minute try was awarded by referee George Clancy after his consultation with TMO Marshall Kilgore even though replays appeared inconclusive. However, Leinster deserved their victory as impressive displays from Eoin Reddan and O'Brien, making his 100th appearance for the province, helped them control most of the second half after being contained despite playing with a wind advantage in the opening period. Sexton's penalty on the quarter hour mark was the only score of a bruising first half with Connacht repelling several threatening attacks from the home side. Connacht were close to snatching a try before the break with Leinster's Ireland wing Dave Kearney making a vital intervention to bundle Niyi Adeolokun into touch after Tiernan O'Halloran's grubber kick. Kearney's initial burst into the Connacht 22 helped set up van der Flier's try on 61 minutes although replays suggested that he may have been held up by John Muldoon. A couple of other refereeing decisions appeared to go against Connacht - including an apparent missed knock-on by Rob Kearney near to his own line - as Bundee Aki attempted to inspire a rally from the visitors with some strong running. Madigan's late penalty confirmed Leinster's victory as they moved to within a point of the Scarlets with also a game in hand. Leinster coach Leo Cullen: "To be only 3-0 up at half-time left after having had the wind advantage definitely left us with a bit of a mountain to climb. "But in the second half, we controlled the ball well in difficult conditions and we're delighted to come away with a win and to keep Connacht scoreless as well." Leinster: R Kearney; F McFadden, G Ringrose, B Te'o, D Kearney; J Sexton, E Reddan; J McGrath, R Strauss, M Moore; D Toner, M McCarthy; R Ruddock (capt), J van der Flier, J Murphy. Replacements: J Tracy for Strauss 60, P Dooley for J McGrath 69, M Bent for Moore 69, R Molony for McCarthy 67, S O'Brien for Murphy 51, I Madigan for Sexton 71, Z Kirchner for R Kearney 75, Boss for Reddan 70. Connacht: T O'Halloran, N Adeolokun, B Aki, C Ronaldson, M Healy, J Carty, K Marmion; F Bealham, T McCartney, N White, A Muldowney, A Browne, J Muldoon (capt), J Heenan, E Masterson. Replacements: D Heffernan for McCartney 69, R Loughney for Bealham 68, R Ah You for White 52, U Dillane for Muldowney 61, S O'Brien for Heenan 52, I Porter for Marmion 63, AJ MacGinty for Carty 63.